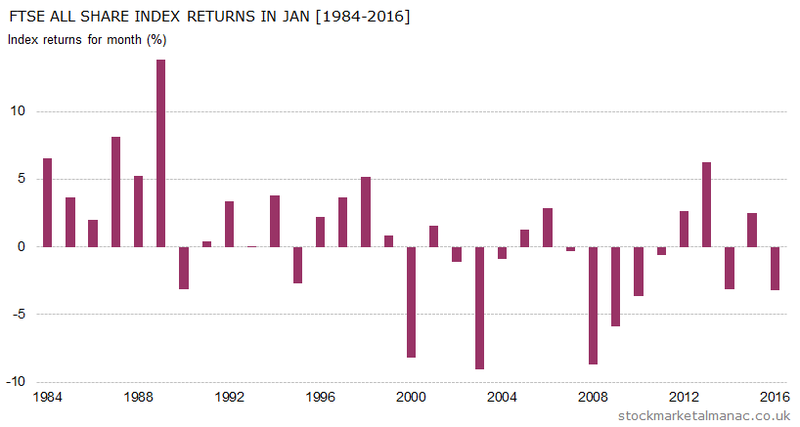 Since 1970 the market has seen positive returns in January in 60% of years and has had an average return of 2.1%. Which sounds pretty good and, indeed, January used to be one of the strongest months for shares in the whole year. From 1984 to 1999 the average FTSE All-Share return in the month was 3.3%, and as can be seen in the accompanying chart in those 16 years the market only fell twice in January. But after year 2000 things changed dramatically. 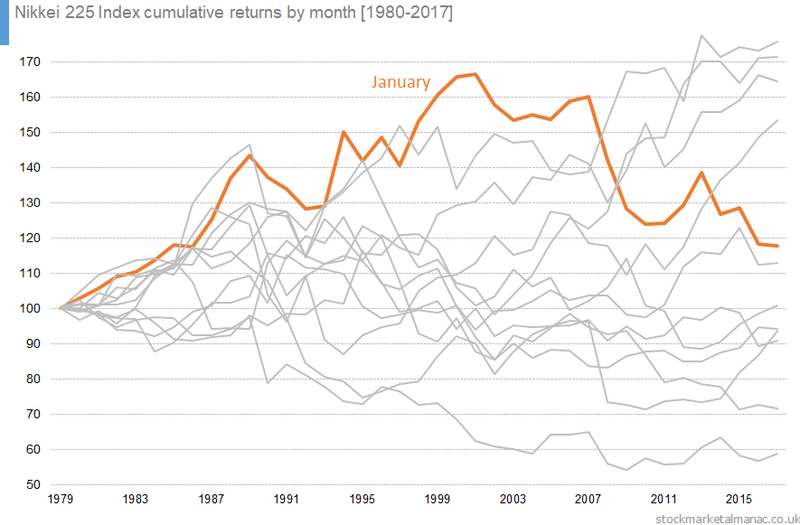 Since 2000 the average market return in January has been -1.6% with the market seeing positive returns in only six years, and in four years since 2000 the market has fallen more than 5% in the month. 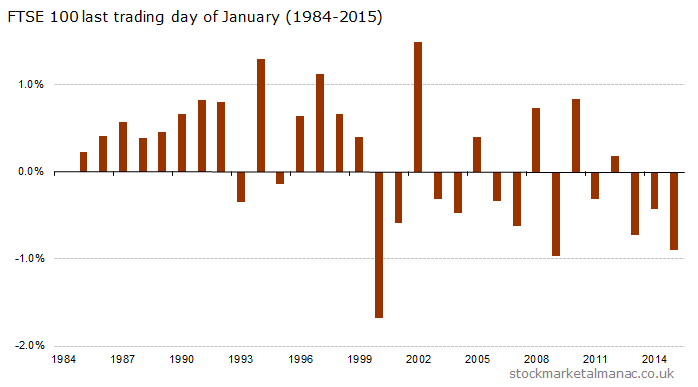 This makes January the worst of all months for shares since 2000. In an average January shares usually start trading strongly in the first few days ­ most likely a momentum effect from the surge in prices traditionally seen in the last two weeks of the year. However, that ebullience soon wears off and prices then slide for the rest of the month until recovering somewhat in the last few days. In the stock market this month is famous for the imaginatively-titled January Effect. This describes the tendency of small cap stocks to out-perform large caps in the month. This anomaly was first observed in the US, but it applies to the UK market as well. For example, since 1999 the FTSE 250 index out-performed the FTSE 100 Index in January in 68% of years, with an average out-performance of 0.6 percentage points. Although it should be noted that the medium cap index has actually under-performed the large cap index the last two years in 2017 and 2018, leading one to wonder if this phenomenon might be breaking down. The FTSE 350 sectors that tend to be strong in January are: Health Care Equipment & Services, Software & Computer Services, and General Industrials; while the weak sectors have been: Electricity, Food Producers, and Oil & Gas Producers. At the company level, FTSE 350 shares that have tended to be strong this month are: JD Sports Fashion [JD. ], Paysafe Group [PAYS], Domino’s Pizza Group [DOM], Mitchells & Butlers [MAB], and St James’s Place [STJ]; while the weak shares have been: FirstGroup [FGP], Berkeley Group Holdings (The) [BKG], Paragon Banking Group [PAG], Royal Dutch Shell [RDSB], Dairy Crest Group [DCG]. Aside from equities, January traditionally sees strong silver prices and weak sterling against the dollar. The following chart plots the month returns of the Nikkei 225 Index in January for the period 1980-2017. In the 40 years from 1950 to 1989, the Nikkei 225 Index only fell in January in 6 years. After that, as can be seen in the above chart, the record became quite a bit more patchy. For example, in the 10 years since 2008, the Index has fallen over 8% in January four times. Further analysis of the Nikkei 225 Index in January over different time periods can be seen in the following table. In the 68 years from 1950 to 2017 the Index had an average month return in January of 2.5%, and saw positive returns in 69% of years. But since year 2000 this has dramatically changed (as was also the case of the US and UK markets). 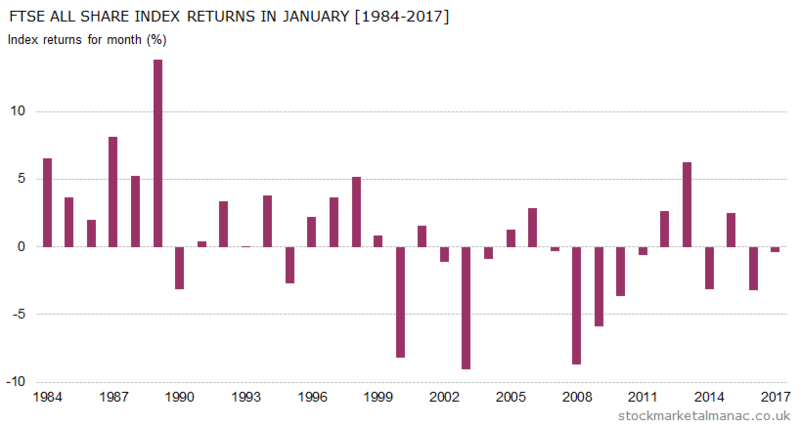 Since 2000, the Index has had an average return in January of -1.6%, the worst average return of any month in this period. 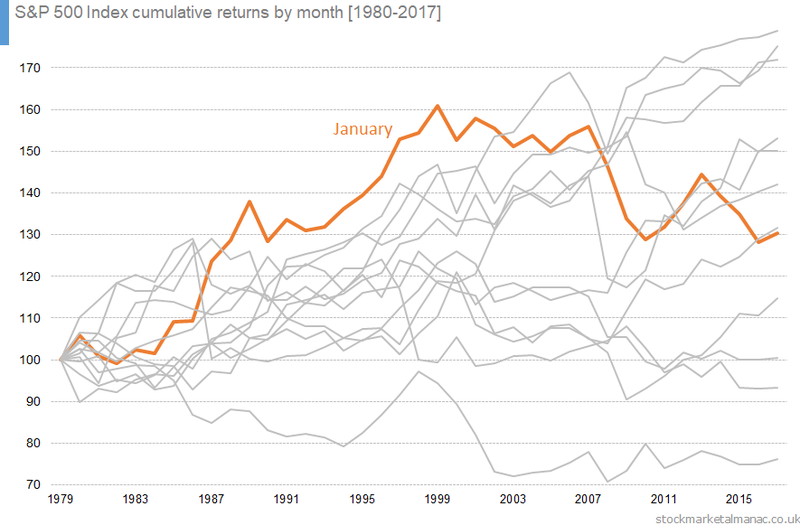 The following charts plots the cumulative returns for the 12 respective months since 1980 (for more explanation of this chart see here). 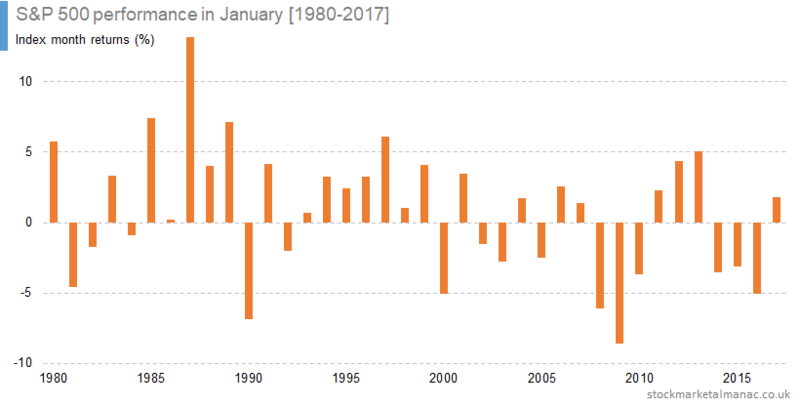 The cumulative performance of January peaked in 2001, at which point it was the best performing month in the year. Since 2001, the cumulative performance has dramatically under-performed that of other months. January used to be one of the strongest months for shares in the whole year. 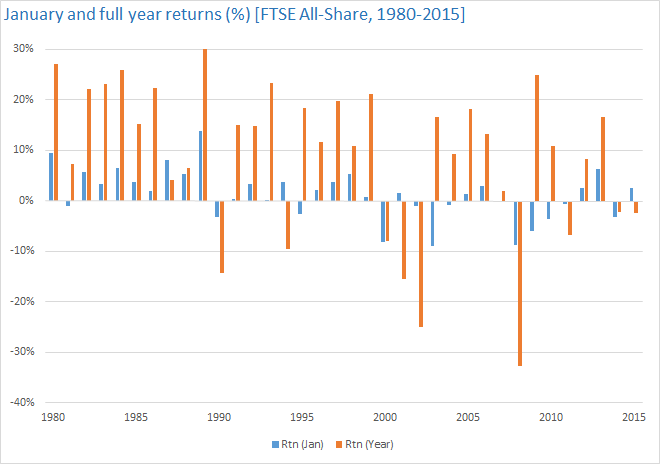 From 1984 to 1999 the average FTSE All-Share return in the month was 3.3%, and as can be seen in the accompanying chart in those 16 years the market only fell twice in January. But after year 2000 things changed dramatically. In the stock market this month is famous for the imaginatively-titled January Effect. This describes the tendency of small cap stocks to out-perform large caps in the month. This anomaly was first observed in the US, but it applies to the UK market as well. For example, since 1999 the FTSE Fledgling index out-performed the FTSE 100 Index in January every year until 2015. The small cap index under-performed large caps again in January 2016, suggesting that the anomaly was no more. But the historical trend re-asserted itself in 2017, with small caps out-performing large caps by 3.9 percentage points in January last year. Since 1800 the market has generally been relatively strong in the eighth year of the decade. It has been especially strong since 1958, with an average annual return of 11.0% and up every eight year of the decade until…yep, 2008. In that year the market fell 33% ­which has rather dented the performance of the decennial eighth years. Remove 2008 from the calculation, and the average annual return in eighth years since 1958 has been a stonking 19.3%. The guidance from the centennial cycle is also encouraging; in 1718, 1818 and 1918 the respective annual returns for the UK market were +0.6%, +5.5%, and +11.0% ­ a steady progression of increasing returns suggesting a return of around 16% in 2018! In the Chinese calendar it will be the year of the dog, which is excellent news. Since 1950, dog years (despite the name) have the best record of returns of the 12 zodiac signs. Since 1950, the average annual return for the S&P 500 Index has been 16.8% in dog years. And, finally, the US presidential cycle has a significant effect on equity markets worldwide, including in the UK. 2018 will be the second year in the cycle and on average the UK market has seen returns of 2.0% in the second year of this cycle. 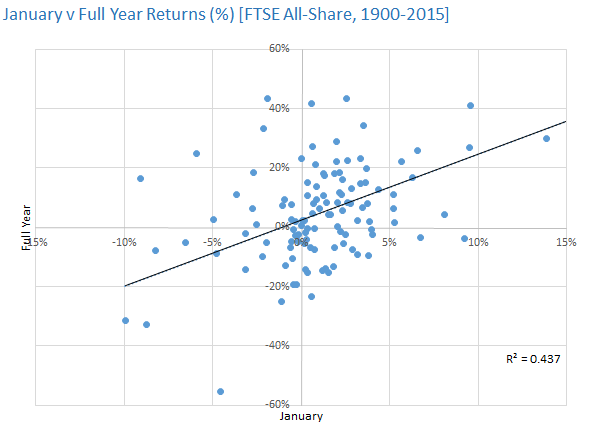 The following chart plots the average performance of the FTSE 100 Index during January since 1984. As can be seen, historically the market tends to rise for the first two or three days in January and then sells off quite strongly over the following two weeks. The second week of January is the weakest week for the market in the whole year. Then, around the middle of the third week, the market has tended to rebound sharply. Other articles about the market in January. 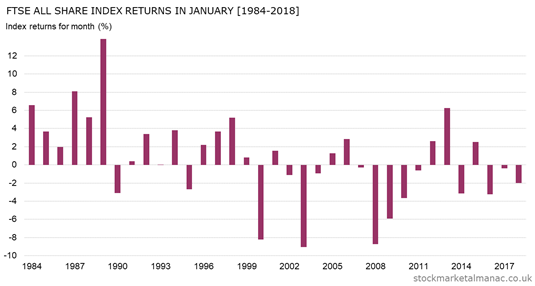 Since 1984 the market has on average risen 0.14% on the LTD of January, with positive returns in 58% of all years (although since 2000 this has fallen to just 31%). The January barometer was first mentioned by Yale Hirsch of the Stock Trader’s Almanac in 1972. NB. The January Barometer is sometimes confused with the January Effect (more on this confusion here). So, does the January Barometer work? the barometer has been correct in 38 of the past 54 years for a success rate of 70 percent. 70% accuracy is not bad. Although Dorfman does point out that this under-performs a naive model (which forecasts the market will be up every year) which has an accuracy of 74% over the same period. How does the January Barometer fair in the UK market? Let’s jump straight in with a long-term view. 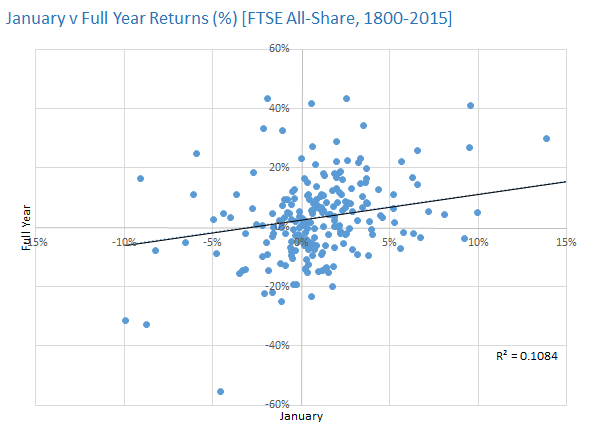 The following chart plots the January and same-year full-year returns for the FTSE All-Share Index since 1800. To support the January Barometer there needs to be a majority of points in the top-right and bottom-left sectors (i.e. 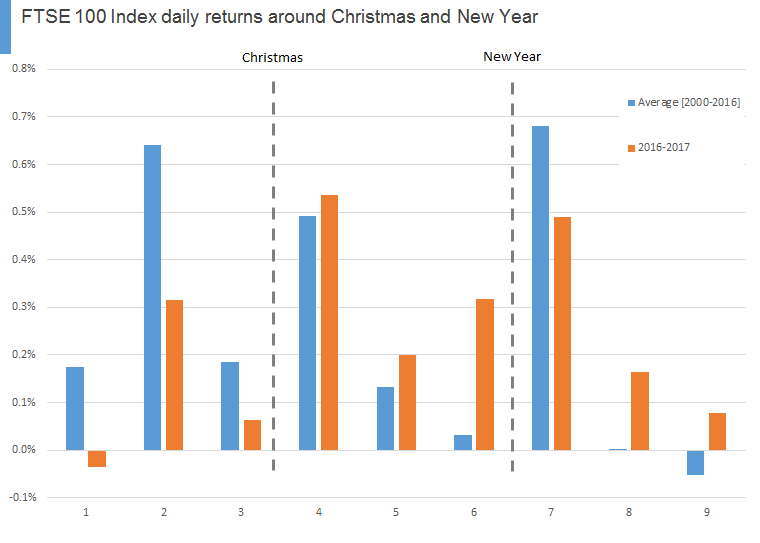 both positive returns for January and the full year, or both negative for January and the full year). And, yes, broadly that does seem to be the case. The line of best fit has a positive slope which agrees with our visual inspection. The correlation (R2) is very low, but to be fair the January Barometer does not claim there is a close correlation in (January and full-year) returns, just that the sign (i.e. the direction) is the same. We’ll now look at a shorter period to see how the relationship changes over time. The following chart is as above except the time period is from 1900 to the present day. Since 1900 the relationship has remained largely the same, i.e. the January Barometer broadly holds. Finally, we look at the (relatively) short-term; the chart below shows the relationship since 1980. And, again, the January Barometer still seems to have worked since 1980. The following table summarises the success rate of the January Barometer over the three time periods. For example, since 1800, the Barometer has been correct for 61% of years. The table also includes figures for the success rate for years in which the returns in January were respectively positive and negative. For example, since 1800 the Barometer was correct for 65% of years in which the market rose in January. As can be seen, for all three periods the Barometer had success rates of over 50% for all years – and so can be considered to have worked. Since 1980 the Barometer has been notably successful. But there can be seen a difference in accuracy between years in which January returns were positive or negative. The Barometer works better in years with positive returns. The following chart might help to visualise the behaviour of the Barometer in recent years. The chart plots the performance of the Barometer for each year from 1980; a 1 is plotted for years in which the Barometer worked, and a -1 in those years when it didn’t. Of late the performance has been patchy, but there was a remarkable run of 12 years from 1982 in which the Barometer worked every year. 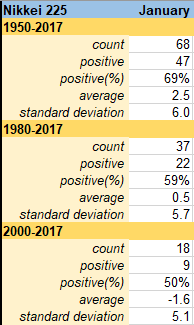 It should be noted perhaps that the market was strong in this period: annual returns were positive for every year except one year. And, as we saw above, the Barometer does seem to work better in years when the market rises. So, is the January Barometer economically significant – i.e. can you trade it profitably? 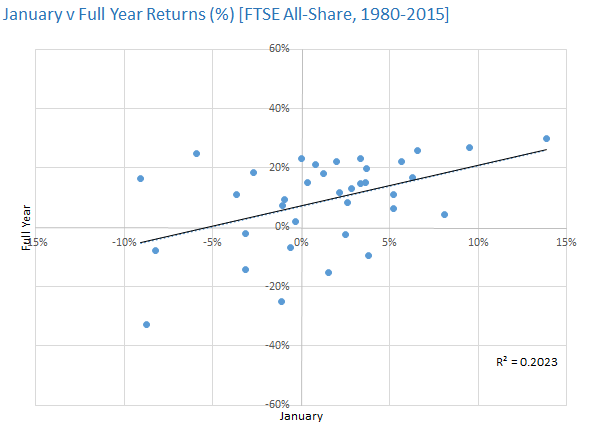 The following chart plots the FTSE All-Share returns for January and the full-year for the period 1980-2015. A concern might be that a significant portion of the full-year returns might be accounted for by the month of January itself. In other words, by the time one acts on a signal from the Barometer, the market has already moved significantly. However, the chart shows that although a disproportionate size of the full year return have been accounted for in January, the remaining returns are significant. Over this 1980-2015 period, if a strategy had invested in the market from February to year-end just in the years that the Barometer gave a signal for a positive market, the average annual return in those years would have been 9.5%. This is marginally better than the average market return for all years over the same period of 9.0%. The January Barometer has had a better than 50% success rate for the three periods studied here: 1800, 1900, and 1980 to the present day. Although one should be wary about assigning a special relationship between January and the full-year. 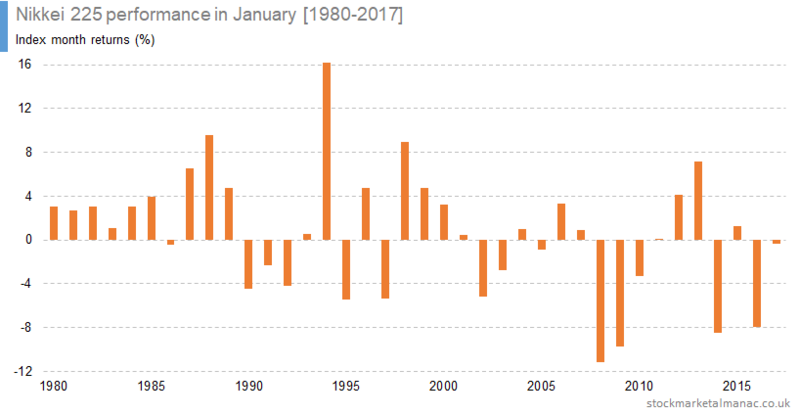 For example, since 1800 the month of February has been almost as good as January in predicting full year returns, and since 1900 February has had a higher succes rate in positive return years. Do the first five days predict the full year? Here, we are going to look at a variant of the January Barometer to see if the first five days of the year predict the return for the whole year. First, we will call this variant of the January Barometer: January Barometer (5D). The bald figures don’t look encouraging: in the 46 years since 1970, the January Barometer (5D) applied to the FTSE All-Share Index has been right in 26 years (57%). 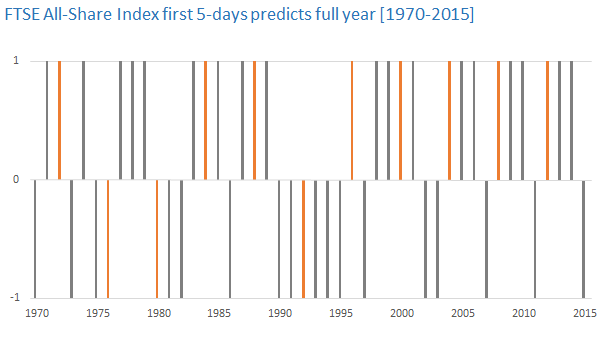 In other words in just over half the years since 1970 the first five days of the year have accurately forecast the full year. 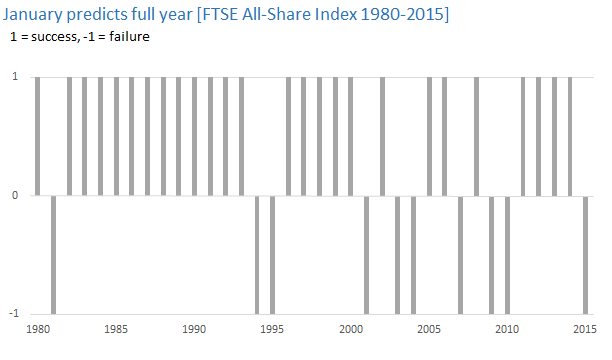 The following is a scatter chart that plots the return on the FTSE All-Share Index for the first five days of a year against the return for the full year, for the period 1970-2015. There is a positive correlation here (given by the positive sloping trend line), however the measure of correlation (R2) is very low. 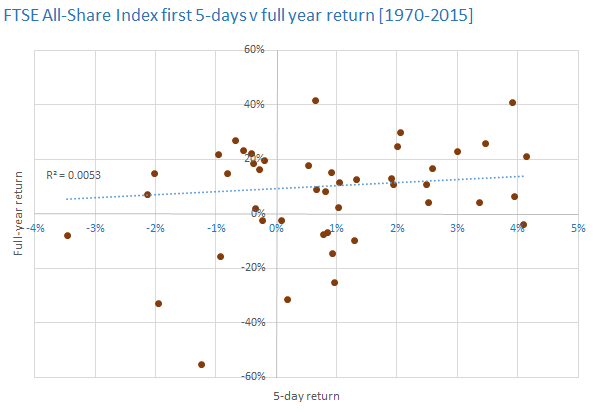 Summary: the chart shows there is a very low level of correlation between first five-day returns and returns for the full year but it is far from being significant. In this chart we can see the roughly even split between years when the January Barometer (5D) works and those years when it doesn’t. However, the distribution of years when it works is interesting, as there does appear to be a certain clustering of years when the effect works and when it doesn’t. For example, in the last 20 years the January Barometer (5D) has been accurate 14 times (a hit rate of 70%). And since 2004 there is this rather odd pattern of not working every fourth year. US presidential elections also have a four-year cycle. On the chart presidential years are marked with orange bars. It can be seen that since 2004 the January Barometer (5D) has worked every year except in years before presidential elections. 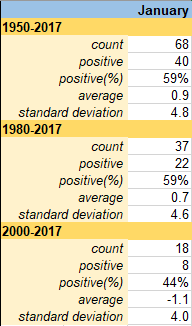 And, over the longer term, since 1970 the January Barometer (5D) has only failed in three presidential elections (a success rate of 73%). Generally, the January Barometer (5D) has a low success rate. However, the effect has been more significant in recent years; plus it has a higher significance in US presidential election years (which 2016 is). In 2016 the market was down in the first five days of the year, and so the January Barometer (5D) would forecast a down year with a 73% probability.